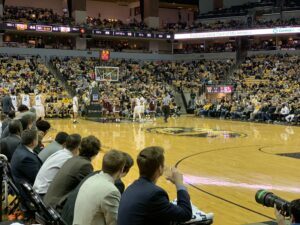 The Missouri Tigers hosted the Texas A&M Aggies in an SEC showdown at Mizzou Arena Saturday. The Tigers came into this game just (2-7) in the SEC and (11-10) on the year, while Texas A&M came in (8-13) and (1-8) in the SEC. The two teams faced off earlier in the season on January 19th and the Tigers beat down on the Aggies 66-43. This time, however, Texas A&M was able to get revenge on a short handed Tigers team, 68-59. The Tigers were without sophomore guard Mark Smith, who missed his fifth straight game with an ankle injury, and Sophomore Jeremiah Tilmon, who was absent due to an emergency oral surgery. The first half started off back and forth with the majority of the momentum swings belonging to the Tigers, who looked strong even without Smith and Tilmon. Towards the end of the first half, it seemed as though Missouri would pull away. Mizzou was up by 12 near the end of the half, but a T.J. Starks three pointer with three seconds left in the half brought the Aggies within nine at 30-21.
and two assists. With this loss, the Tigers now fall to .500 on the year with a record of (11-11) and (2-8) in the SEC. The Tigers, now losers of eight of their last ten, hope to bounce back on Tuesday, February 12th at 8 P.M. at Mizzou Arena against the Arkansas Razorbacks. The game will be aired on ESPNU.